Food and music—they're the beating heart of the 60-plus country Parade of Nations, stepping into its 29th year on Saturday, September 15. Mouth watering yet? Parade of Nations is known for affordable, authentically prepared cuisine. Supported and coordinated by Michigan Technological University, Finlandia University, the cities of Houghton and Hancock, and businesses and organizations throughout the Keweenaw, the Parade of Nations and Multicultural Festival attract thousands to Houghton-Hancock in mid-September. Planning is by necessity, a community-wide, year-round endeavor. "The Parade of Nations committee selected 'Global Beats, International Treats' as the 2018 theme because it encompasses what the event offers to our community—international traditional music and exotic cuisine," says committee co-chair Vienna Chapin, study abroad coordinator with Michigan Tech International Programs and Services. After nearly three decades, choosing a fresh theme gets successively trickier. But it's a piece of cake compared to some other components of the event, which begins with a procession through Hancock across the Portage Lake Lift Bridge to Houghton's Dee Stadium. The historic waterfront venue is transformed into a global marketplace offering dozens of food and craft booths with live performances of performing arts from around the world. 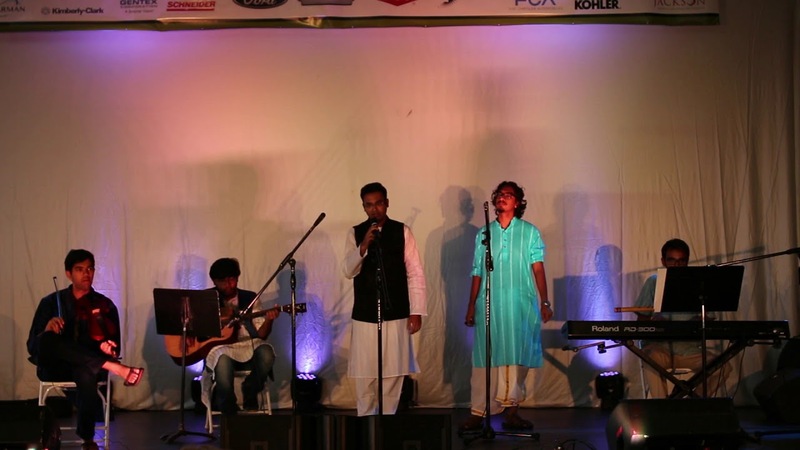 From the Grand Entrance of Keweenaw Bay Indian Community to Finnish Copper Country cloggers, songs of India to belly dance fusion, the festival stage is an afternoon-long whirlwind of color, culture and crowd-pleasing song and dance. Parade of Nations closes the evening with a family-friendly international headline act at Rozsa Performing Arts Center—to be announced later this summer. 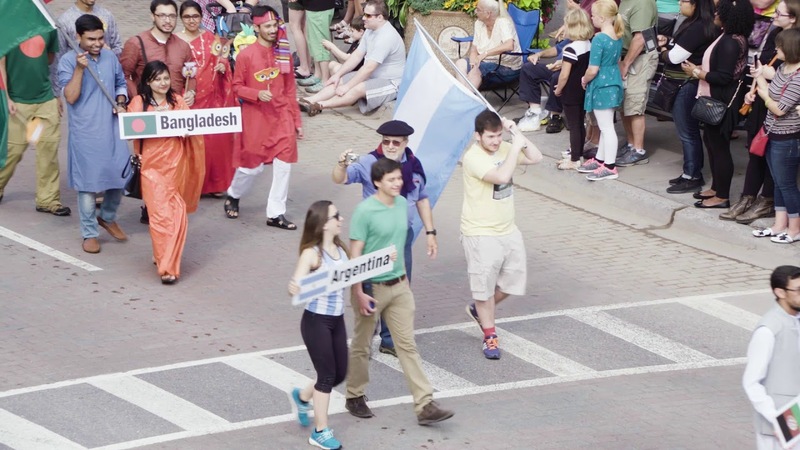 Co-founded by Betty Chavis and Mary A. Brunner, the Parade of Nations and multicultural festival began in 1990 as a way to acknowledge and celebrate the cultures and countries of Keweenaw residents and visitors, many of them Michigan Tech international students. In a Silver Jubilee interview marking the event's 25th year, Chavis recalls how the idea of a festival arose: she'd been fielding questions about the strange aromas emanating from buildings and apartments around the community. "It was students from other countries cooking with their various spices," she said. Food was a way to bring unfamiliar cultures together. Beyti kebabs to mango lassi, Cornish pasties to poblanos rellenos, the traditional dishes created by students, faculty and local restaurants continue to draw eager diners to the festival every year. Parade of Nations Co-Founder Betty Chavis has turned over organizational duties, but you'll still find her enjoying the people and the food at the region's largest multicultural festival. Chapin says the international cuisine is her favorite part of the event. "I am a huge foodie who watches travel shows featuring exotic food; I get so excited that Parade of Nations offers dishes from around the world." For more about the parade, multicultural festival and how you can be involved, follow the Parade of Nations Facebook page. "Now that the theme has been announced, it's not too early to start thinking about your parade float," Chapin says. "Floats are judged on creativity and how they relate to the Parade of Nations theme." There are two categories: university and community, with a $200 first prize for each and $100 second-place prize.